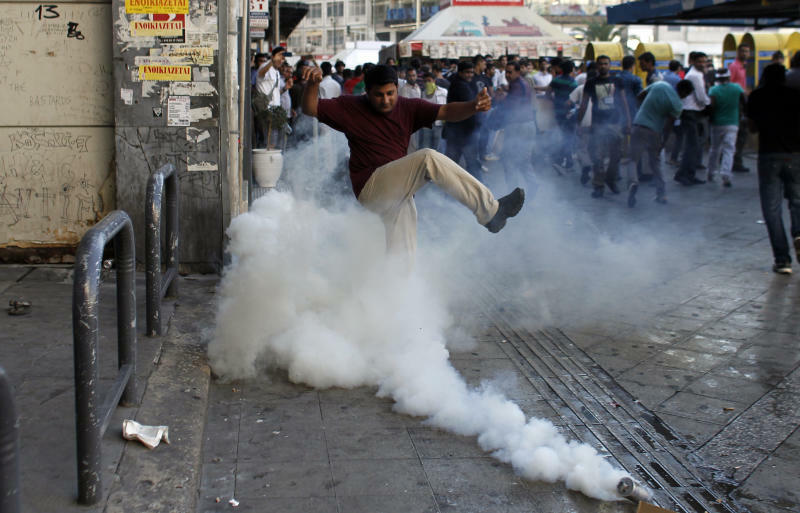 ATHENS, Greece (AP) — Greek riot police used tear gas and pepper spray to disperse Muslim protesters who clashed with officers Sunday during a rally against a film produced in the U.S. that denigrates Islam's Prophet Muhammad. No injuries were reported. A general strike in Bangladesh shut down schools, transportation and businesses, while a few hundred people peacefully marched in Pakistan. Iranian students burned flags in Tehran to protest the recent publication of lewd caricatures of Muhammad by a French satirical weekly. In Athens, six people were detained during the demonstration at a central square, police said. About 600 people attended the rally, which featured heated speeches, but was mostly peaceful. The crowd then wanted to march to the U.S. Embassy, which is about three kilometers (two miles) away from Omonia Square. Some tried to break through police lines several times, but riot officers pushed them back. The violence occurred at the end of the rally, when small groups of protesters threw objects at police. Three cars were damaged and three storefronts smashed. Banners were displayed in English, denouncing the film and called on the U.S. to hang the filmmaker. One told President Barack Obama "we are all with Osama," referring to Osama bin Laden, the al-Qaida leader who was killed in a U.S. raid in Pakistan in May 2011. The amateurish film, which portrays the prophet as a fraud, a womanizer and a child molester, has sparked violent protests throughout the Muslim world for nearly two weeks. 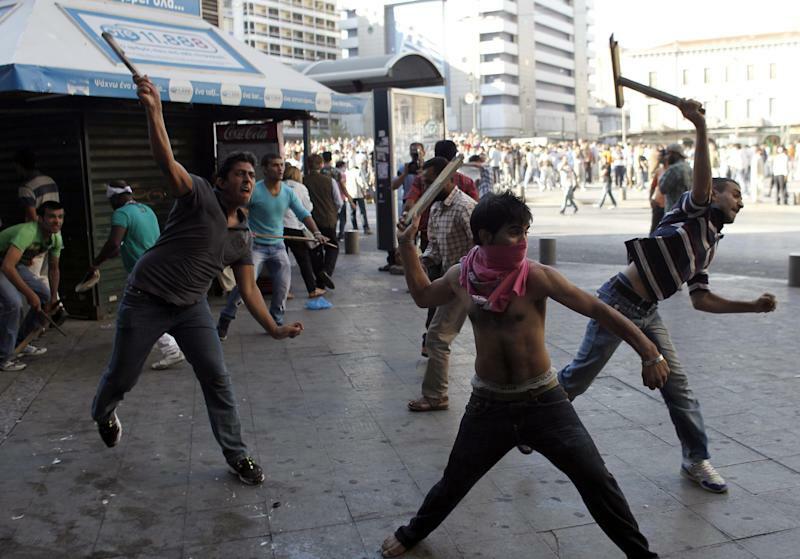 The violence linked to protests over the film has resulted in the deaths of at least 49 people, including the U.S. ambassador to Libya. About 300 Iranian students protested against the caricatures that appeared in the French weekly. They rallied in front of the French Embassy in Tehran, burning French, U.S. and Israeli flags and chanting "death to France" and "down with the U.S." They called for the expulsion of French ambassador to Iran. In an interview to be aired Monday on CNN's "Piers Morgan Tonight," Iranian President Mahmoud Ahmadinejad was asked about the protests in the Muslim world. "Offending the Holy Prophet is quite ugly," Ahmadinejad said. "This has very little or nothing to do with freedom and freedom of speech. This is the weakness of and the abuse of freedom, and in many places it is a crime. "But we also believe that this must also be resolved in a humane atmosphere, in a participatory environment and we do not like anyone losing their lives or being killed for any reason anywhere in the world." 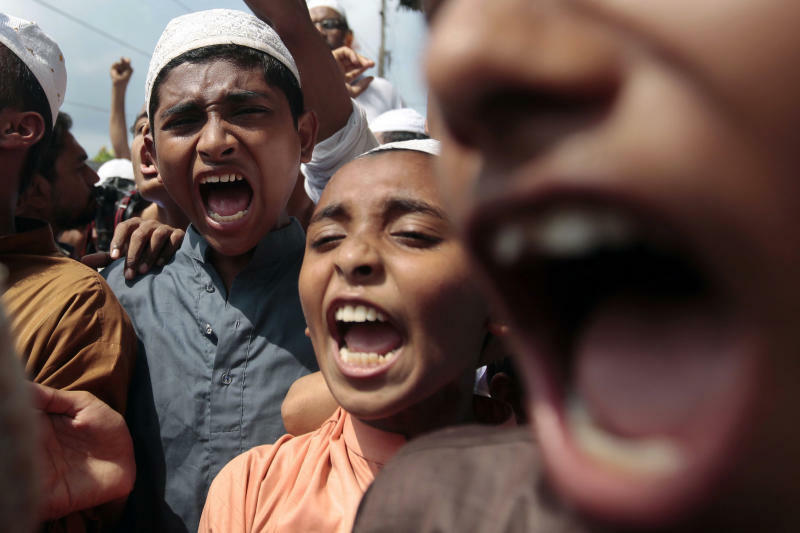 In Bangladesh, schools and businesses were closed and transportation was disrupted across the south Asian country as hardline Islamic groups protesting the film enforced a general strike. The strike was called in response to police action Saturday against supporters of the groups who rallied in the capital, Dhaka, to denounce the film. Dozens of people were arrested and scores injured Saturday as protesters clashed with police. Several vehicles were burned, including a police van. No violence was immediately reported during Sunday's strike. About 300 Christians, Sikhs, Hindus and Muslims peacefully rallied in Pakistan's capital, Islamabad, to protest the film. "There will be no peace in the world until we respect each other's religion," Sikh leader Deedar Singh said. The protesters marched about a 1 kilometer (just over a half mile) on Islamabad's main avenue near the parliament building.